My friend, and amazing crochet designer, Amanda Perkins popped round for a chat. We don’t often get the opportunity to chat face to face, since I live in the North West and she lives in Devon! But today she stopped off on her way to Yarndale, the festival of woolly wonders which is on this coming weekend. Amanda has a stand there and it will be the first time she is exhibiting purely as a designer. It was fantastic to see her and get a real opportunity for a good chat. I will be going to Yarndale on Saturday, and will see her again, but we won’t really have any quality chatting time as Yarndale will be buzzing! She has told me her plans for her stand, which include some of her amazing blankets, some yarn (the last of the now very rare Natural Dye Studio yarn, and some of the gorgeous John Arbon Knit by Numbers) and an array of her gorgeous patterns. Her stand is right in the centre of Yarndale, very close to Lucy’s Knit n Natter lounge. So please look out for her on stand number 80. The second thing to make me happy today was what Mrs Postie delivered – my contributor copy of Inside Crochet issue 70. 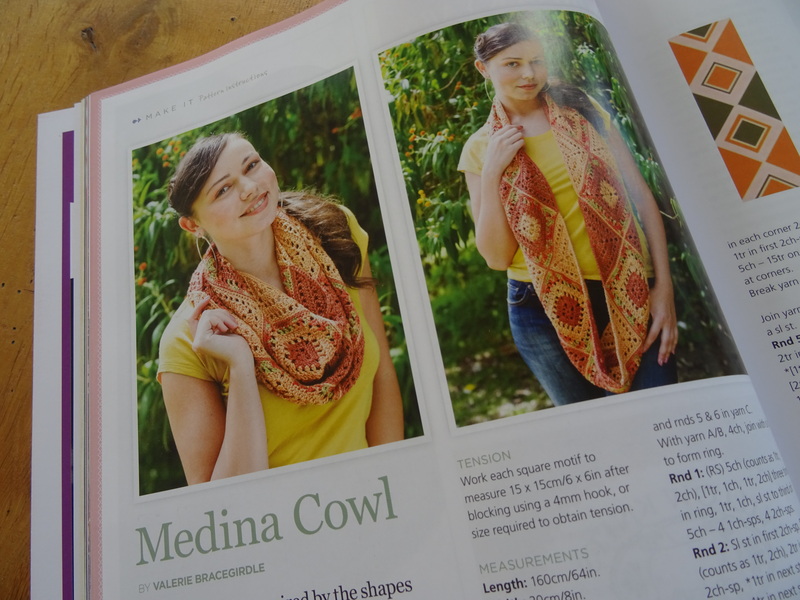 I have a design in it, the Medina Cowl. This is made with some luscious silk from Willow Knits. I am very pleased with this design. It uses 3 beautiful colours of silk and the components are quite simple, but the joining is a feature which may prove a bit challenging to some (although it will become easier the more you practice). Willow Knits is also at Yarndale, so please pop by and see Anne on stand 101, I am sure she’ll have these beautiful autumnal colours of silks! Finally, do also pop by the Inside Crochet stand (159) – you may even see Medina Cowl ‘in the flesh’! And I’ll be there at around 2.30pm. I do hope to see some of you at Yarndale. Tis the night before Yarndale…. I’m really loving all the pre-Yarndale posts. It just adds to the anticipation! I’m going Sunday. I’ll look out for you friend’s stall. Thank you. It’s adding to my anticipation too!! !